I love fermented salsa and I was a little dismayed to find out that fermented salsa, due to tomatoes sugar content, should be eaten within a month or two of making it. Boo! One of the reasons I ferment is to help food last longer. 1-2 months isn’t long enough for me. Granted, 1-2 months is a lot longer than fresh salsa lasts so that does make me a little happier. Since we’re rolling in tomatoes right now, I’d like to have some salsa on hand midwinter when I’m no longer sick of them (I processed 60+ lbs of tomatoes yesterday, bleh). So my solution? I’m going to freeze some fermented salsa. Freezing is a fine option if you want the benefit of a ferment that has a shorter shelf life. It’s certainly not as wonderful as a fresh ferment but it is a good option if you have a midwinter hankering for salsa and no good tomatoes are in sight. Plus freezing is better than throwing it out if you can’t eat it fast enough. Some of the LABs can survive freezing and whether they do or not, the extra vitamins are still there along with beneficial acids. And it still tastes great! I do this with fruit ferments like salsa, chutneys and fermented jams if I’ve made more than we can consume within a few weeks. You can also freeze them in freezer bags if you desire. Another option is to spoon it into ice cube trays and once it’s fully frozen, put them in a large freezer bag. This is a nice way to take out just a serving or two at a time. Looking for a good salsa recipe. Try this Watermelon Salsa from Lisa’s Counter Culture (I’m whipping up a batch today myself). Pickl-It has a more traditional salsa recipe here that I’ve heard is wonderful, Antioxidant Rich Pickl-It Tomato Salsa. Lactofermented Smoky Peach Salsa. Use an anaerobic vessel like a Pickl-it. I don’t recommend using mason jars for fermentation anymore. I’m also dying to try this recipe from Divine Health, Smoky Peach Salsa. I love salsa, I love peaches and I love chipotle peppers. This sounds amazing! To adjust the recipe for anaerobic fermentation, simply leave out the whey and use 5 gms of salt per 4 cups of salsa. When Lydia made it, she was able to get 1 quart plus 1 pint out of it, which is 6 cups (that would probably fit in a 1.5L or 2L Pickl-it). 6 cups of salsa would need about 7-8 gms of salt. Let set at room temp for about 2 days and you’ll want to use this up within about a month. Of course, freeze whatever you can’t use fresh! If you haven’t seen this yet, Lisa from Lisa’s Counter Culture released her new book Lisa’s Counter Culture: Pickles and Other Well Bred Foods. I have the book in my hands now (well, on my iPad) and plan a review very soon. From what I’ve seen so far, this is the best book on the market. 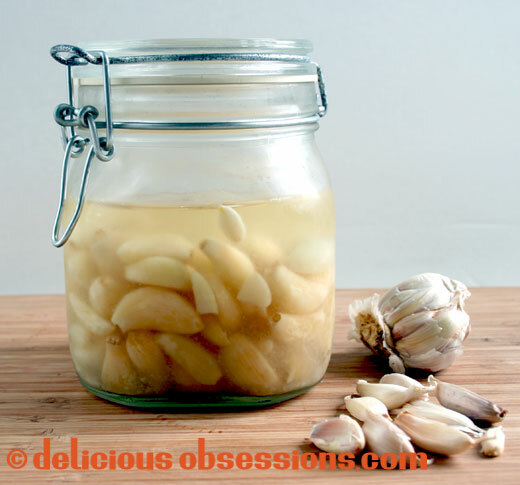 This week, Jessica from Delicious Obsessions shared her recipe for lactofermented garlic. This was one of the first ferments that she ever made, and she went back and revised the recipe for the Pickl-It jars. This garlic has amazing flavor and it just gets better and better with age! She says the brine is heavenly in salad dressings! And Jennifer from Hybrid Rasta Mama has this great post on mold, Mold On and In Your Ferments. Do you just scrape mold off or do you toss your ferment if it has mold. I used to just scrape. Now it gets tossed. What do you have fermenting this week? Let me know in the comments. I know this is way years later, but wondering about fermenting in reverse. As in freezing the fresh salsa, and then fermenting it after the thaw. Thoughts?